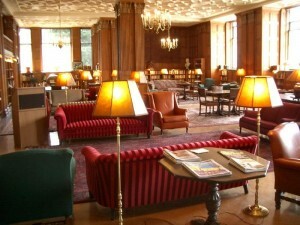 It reminded me of the Lane Reading Room at Stanford. There’s a sign at the entrance that says no cell phones, no food, and no sleeping; perhaps the first two rules are enforced, but I saw students dozing in chair and couches around the quiet, cozy room. I tucked myself into in a large red chair and lost myself for a few hours in Harpist in the Wind by Patricia A. McKillip, which I picked up from the Berkeley Public Library yesterday. What a lovely way to spend an afternoon. This is my favorite room on campus. The library in VLSB is also pretty nice.